Monday evening Martin and I filling our birdfeeders, in front of the house, when the UPS truck pulled up. My UPS guy and I share a special bond: We’re both New York Rangers fans. We hadn’t talked since June 13, when the Rangers dropped the Stanley Cup finals to the Los Angeles Kings, so we started to chat hockey emotions. Were we heartbroken? Proud? Was this transition season—the Rangers have a new coach—the start of a dynasty? Would we miss Brad Richards? Goodness, I thought. Martin just addressed a stranger, without being prompted. That’s new. “Hey, little man,” the UPS guy said and patted Martin’s head. Goodness, I thought. Martin just interpreted my social cue and said goodbye, without being prompted. That’s new. When Martin does something new, and appropriate, and typical, I remind myself to blog. Often I make a note so I’ll remember to write the event. If you’ve been reading this blog a long time, you know about the first time Martin said, “I don’t know,” and the first time Martin interactively shared a toy, and even the first time he understood that my outstretched hand meant I wanted a napkin from him. When I brought Martin to playgroup in the City last week, we were late, and his friends were already downstairs. Martin proceeded directly downstairs. No distraction from the upstairs toys? No direction needed? No dawdling on the steps? That’s a first. Noticing what Daddy is wearing? Wanting the same for himself? First. Providing more information than I asked for? Thinking ahead? First. Checking my face for reassurance? Immediately recovering from a sensory overload? Laughing at himself? Unsolicited emotion sharing? First, first, first, first. Independent participation? Imitation just for the heck of it? Not quite a first, but close enough—never before so vivid, or so immediate. Monday afternoon Martin and his friend Christopher were in a children’s waiting room, ostensibly overseen by Christopher’s older brother, Benjamin, while I met with Christopher’s mother. When I entered the waiting room, Martin and Christopher were wrestling, gleefully, amidst a pile of toys as Benjamin laughed. “What on earth are you two doing?” I asked. Martin said, “I’m banging, and he’s yelling.” Then he returned to struggling with Christopher. Fully interactive play? Answering questions even while epically distracted? Pretty darn new. Fifteen minutes later, Martin and I were driving home when he read aloud the name of Steely Dan’s “My Old School” from the radio screen. I took the opportunity for conversation and asked Martin the name of his old school, his preschool. He responded correctly. I followed up by asking which he prefers, his old school or his new school (his kindergarten). Expressing a legitimate preference, and backing it up with a reason? First. Not to mention—I do think he’s learning better in kindergarten. His kindergarten really targets his needs in a way that preschool did not. Am I proud? I’m darned proud. I mean, Martin’s bus driver is also a Rangers fan. I miss the morning hockey chit-chat. On another occasion, Martin (right) with Christopher’s big brother, Benjamin. Martin has three rain jackets. The first raincoat he acquired when he was two years old. It is a yellow hand-me-down, big enough for a nine- or ten-year-old, from our then-neighbors. The second and third rain jackets are blue and red, and sized much more appropriately for a kindergartner. Samara bought them for Martin a couple years ago. For a long time, Martin preferred the yellow raincoat, even refusing to wear the blue or the red. He didn’t seem to care that the yellow raincoat was so big that it bunched around his knees, got tangled between his legs, sometimes tripped him. Yellow is Martin’s favorite color. At the first sight of a raindrop, he wanted that yellow rain jacket. We’ve had a lot of rain lately. To my surprise, Martin selected the blue rain jacket to wear, twice in a row, and then the red rain jacket. Two biggies in that convo: First, Martin told me a plausible reason for his preference. And even though he made his “but because” mistake, he stated his reason plainly and appropriately. Second, Martin rationally chose not to select the yellow item. Kids on the spectrum like repetition. They like sameness. So does Martin, but perhaps his “stuck in a rut” mentality is beginning to loosen. What’s next? Actually accepting an orange subway seat, if the yellow ones are all occupied? Taking advantage of one of the sunny days. 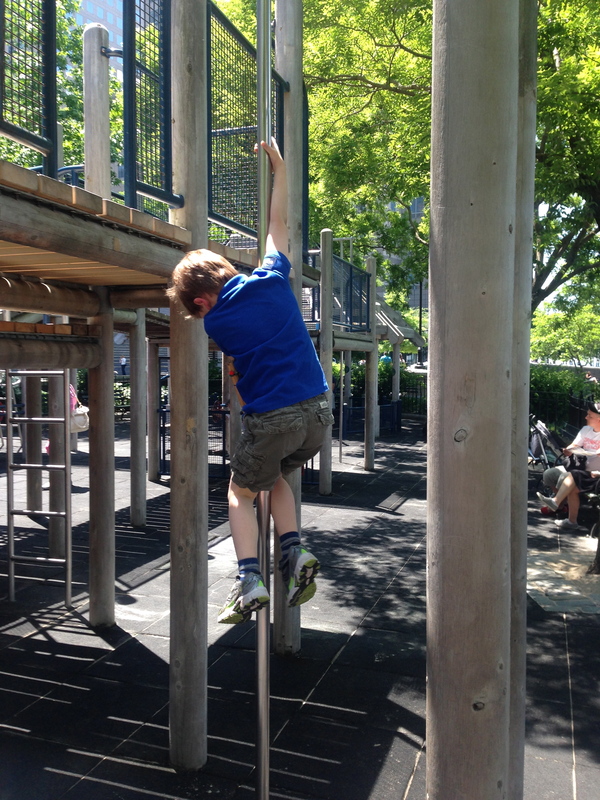 Learning to slide down a pole—to put both hands on, leap from the platform, and wrap his legs—has been a big achievement for Martin. In the post “What Comes Last,” I noted Martin’s continued difficulties with socializing, especially in group situations, when he just doesn’t seem able to find an entrance. 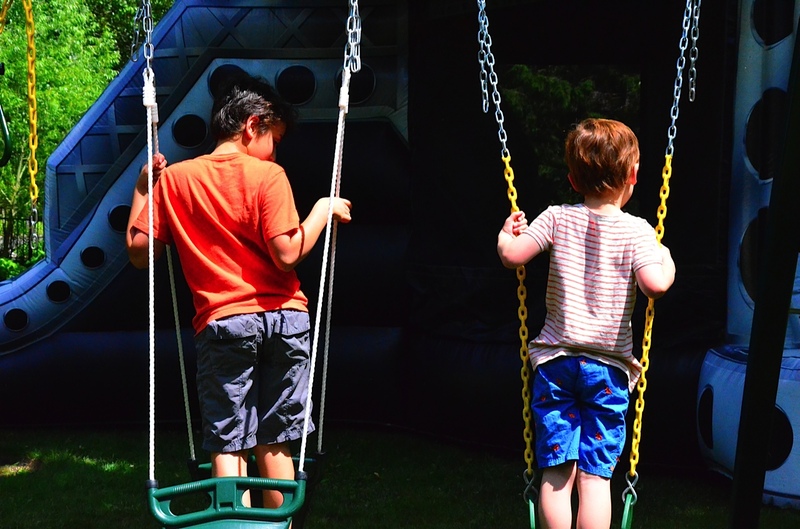 We were at yet another bouncy-house birthday party last month. Adrian and I were alternating between snapping iPhone pictures and chatting with parents. The kids were running wild. Some were interacting, such as throwing sport balls at each other, on the various apparatuses. Others were jumping and sliding alone. Martin, of course, fell into the latter category. —Until he bounded up to me, exclaimed, “Mommy, come play with me!”, grabbed my hand, and pulled me toward one of the inflatables. I went. It was the first time Martin had tried to pull me toward anything, ever. To be clear: It was only me whom Martin tried to pull into a game, not another kid. Moreover, he hasn’t done so again since. But it happened. As they say: It’s in there. Martin has the desire, and slowly the skill, to bring others to him. I that sometime in the next six months he will try the hand-pull move again, first with me and then, I hope, with other kids. 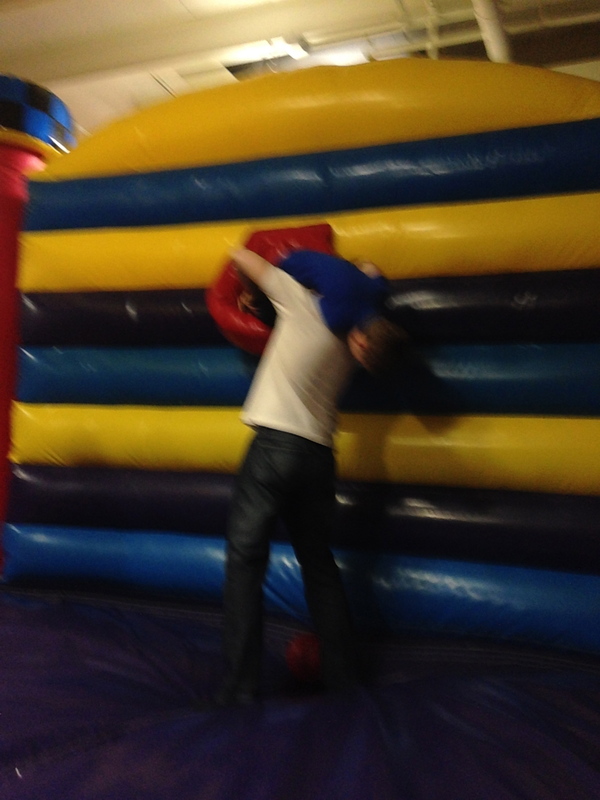 A blurry action shot: Adrian and Martin clowning at the birthday party. It’s blurry because I was standing in the same bouncy house.